It's time for the emergence of our favorite pesky little summer bloodsuckers. Summer solstice begins the emergence of mosquitoes, which have a history that predates humans. Here is the evolution of our favorite pesky little summer bloodsuckers. The summer solstice has officially begun for 2018 and while many of us are gearing up with afternoons of pool parties, cookouts, music festivals, and vacations, something some of us are not planning on are the annoying appearance of mosquitoes. The origin of mosquitoes date back to long before humans. In fact, research suggests that the pesky insect was around in the Jurassic period - the age of dinosaurs. Scientists also believe that mosquitoes originated on the continent of Africa and eventually spread to the rest of the world. By 2018, they have evolved into more than 2,700 different species. While we are particularly focused on preventing and ending a bite, we rarely give thought to the start of life for a mosquito or its gestation period. Most mosquitos remain within one to three miles of their breeding site. You would think that this would be farther give that mosquitoes flap their wings between 400 and 700 times per second. Wind currents are the main dictators of how far mosquitoes travel whereas humidity, rainfall, and surface temperatures are keys for breeding season. Female mosquitoes can lay a set of up to 100 eggs every third night and can lay up to three separate sets of eggs before dying. 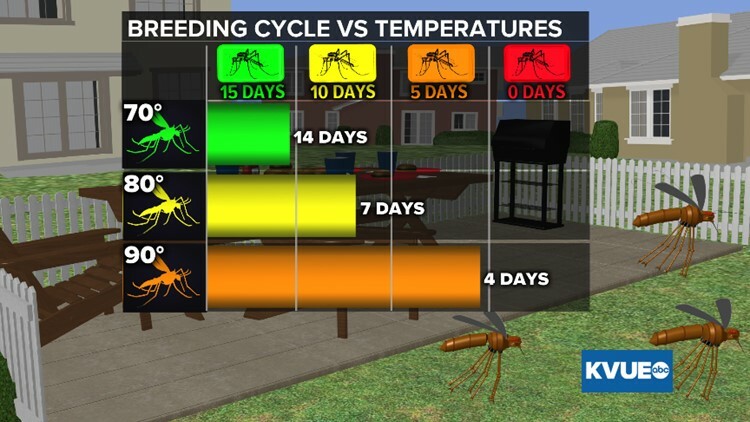 With recent rainfall and 70 degree heat, it can take up to 14 days for eggs to hatch. In 80 degree heat, that figure lowers to seven days, and only four days in heat of 90 degrees. In light winds, mosquitoes are more active when winds are less than 10 mph. Some like to feed just before nightfall aka dusk, others can feed throughout the day or whenever a host is available for it. Here are some interesting fun facts about mosquitoes.